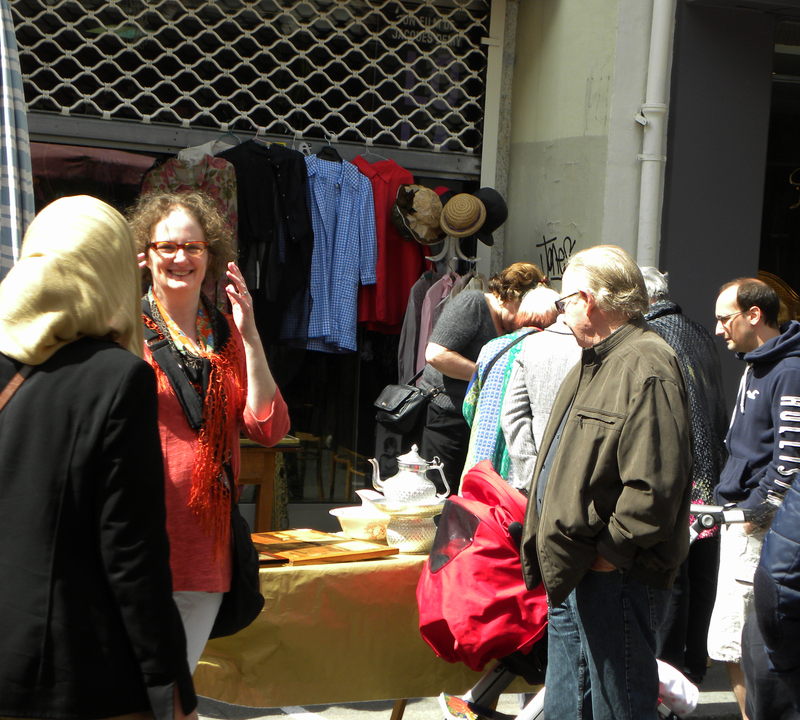 One Sunday a few weeks ago, my sweetie and I decided to check out the community yard sale (vide-greniers) on Rue Daguerre in the 14th arrondisement. It was a beautiful day for a stroll along the shops and stalls set up along the street. It’s not a touristy place at all, and has an authentic French feel about it. The neighborhood doesn’t have any actual yards nor garages to hold yard sales so they just set up tables out in the street, which was closed to traffic. I’m not sure what I was expecting but this community yard sale was amazing. There were some 200 residents who had little tables set up with curiosities, antiques and junk. It was a very social event because the stalls were jammed next to each other. 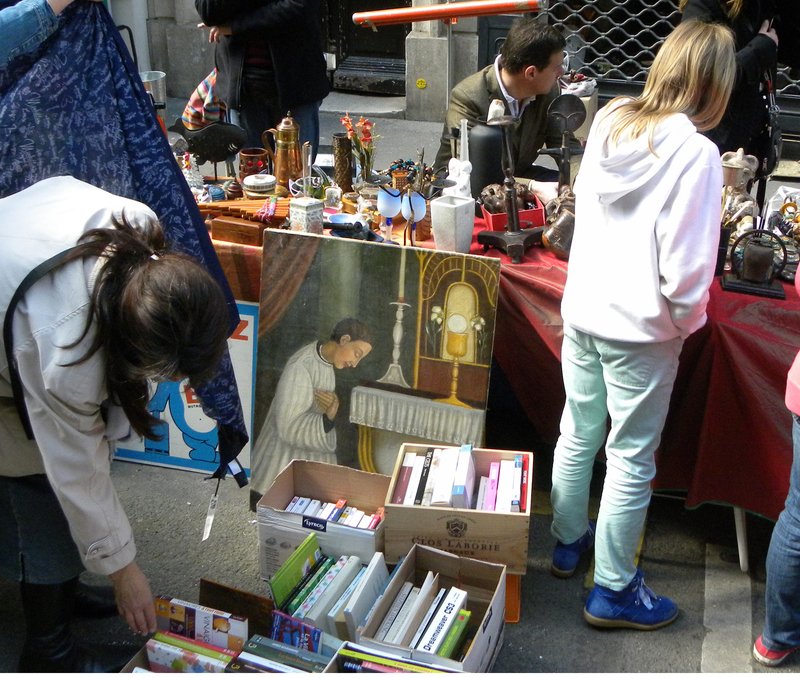 I wandered down the street looking at the stalls and saw designer clothing, vintage jewelry, children’s toys, lots of books, used kitchen tools, odd paintings and figurines, and all kinds of other stuff. At one woman’s table, I rummaged through some old jewelry and at the bottom of pile was a plastic bag with a dusty old makeup case set. I pulled the items out of the bag and realized the objects were covered in face powder, not dust. 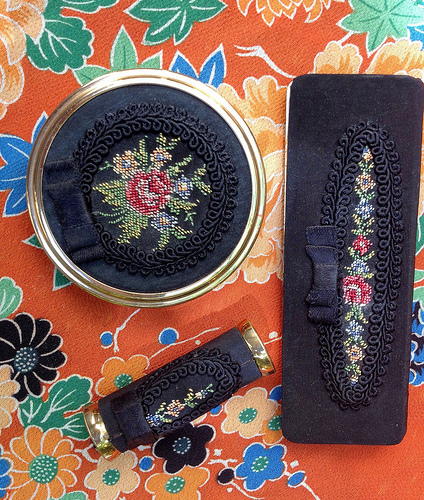 I brushed them off a bit, and saw that the cases were covered in silk, with petit-point insets created by hand. The woman selling them said they were from the 1950s and were “typically French.” I bought the set as a fun souvenir. There’s a comb case with a comb, a lipstick holder that looks like it’s not been used, and a compact with powder and a very fuzzy feather powder puff that I’ll probably toss. 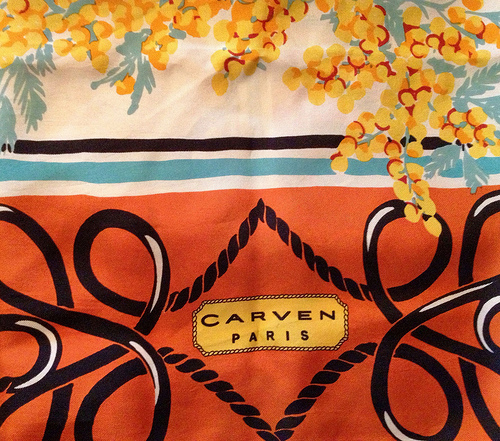 Of course I had to dig through all the boxes of scarves in case there was an Hermes silk scarf calling my name; I didn’t find one but I did find this colorful scarf by Carven. It cost a euro! The best part of the adventure was yet to come. I sat down at a cafe for a while to people watch and Todd came back and told me he’d seen and gotten to talk to film director Agnès Varda. Wow! For those not familiar with Madame Varda, she’s a French film director whose early works are considered precursors of French New Wave cinema. Her films include the seminal Le Pointe Courte (1956) and Cléo from 5 to 7 (1962) and the more recent Beaches of Agnes and The Gleaners and I. Meeting this iconic director was a great experience; she was gracious and charming. She was busy selling things at the sale for a non-profit she works with that empowers young women so I didn’t ask her for an autograph. Also, I didn’t want to look like the déclassé American tourist in front of her home and business. For more information on Agnès Varda, see this short essay at the Criterion Collection and her faculty page at the European Graduate School. Her company, Ciné-Tamaris, produces and manages both her and her late husband Jacques Demy’s work. 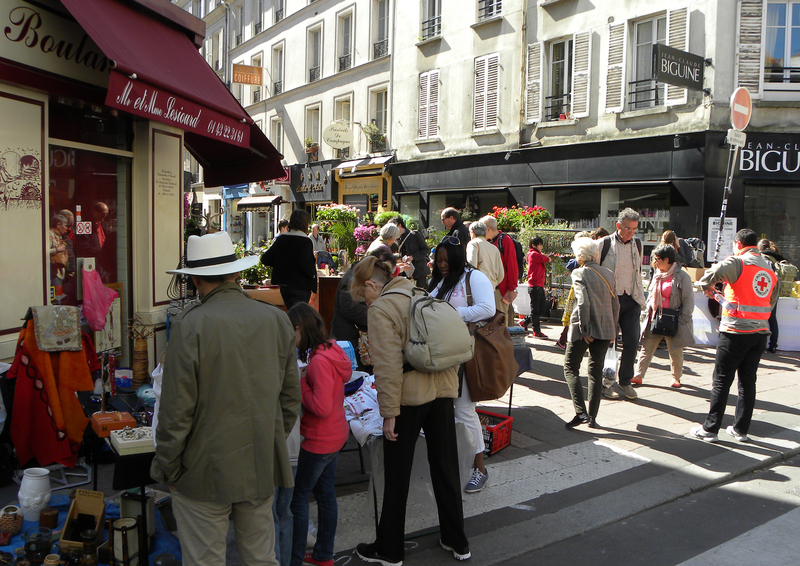 This adventure down Rue Daguerre was one of the highlights of our trip. I’ll write soon about a Man Ray exhibit I saw in London and a haute couture exhibit in Paris. 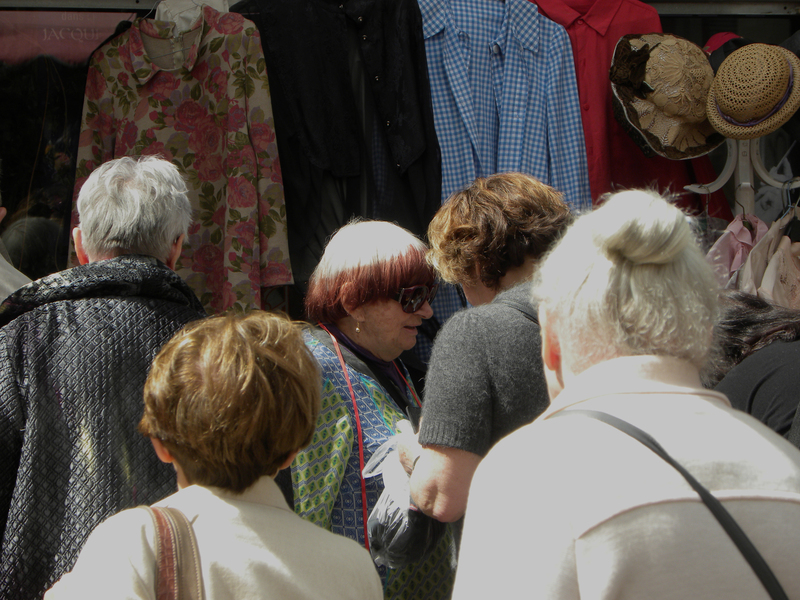 This entry was posted in Paris and tagged 14eme, Agnès Varda, Paris, rue daguerre, vintage, yard sale by Tweed Librarian. Bookmark the permalink.